Could Wilt Chamberlain dunk from the free throw line? I have read in this ESPN article that Wilt Chamberlain could dunk the ball from the free throw line. Did he really do that? Is there any proof of him actually doing so? After watching many Wilt Chamberlain dunk compilations and reading many articles on The Big Dipper, I can say with a large degree of certainty that Wilt Chamberlain was able to dunk the ball from the free throw line. For the second question, if by "proof" the OP means "video evidence" then I'm afraid it simply cannot be found if it even exists. On the other hand, in terms of proof, a strong case can be built that Wilt Chamberlain was able to dunk from the foul line via Witness Testimony and Wilt's Self Proclamation. "The big guy takes aim at the basket from several feet behind the line. Then he takes about three giant steps, leaves his feet before reaching the line, and stuffs the ball through the hoop." "Why, he would have a free throw percentage of 100." said Winter. "He never missed." " When I was a freshman, I fooled around with shooting free throws this way: For some reason, I thought you had to stay within the top half of that free-throw circle, so I would step back to just inside the top of the circle, take off from behind the line and dunk. They outlawed that, but I wouldn't have done it in a game, anyway. I was a good free throw shooter in college." 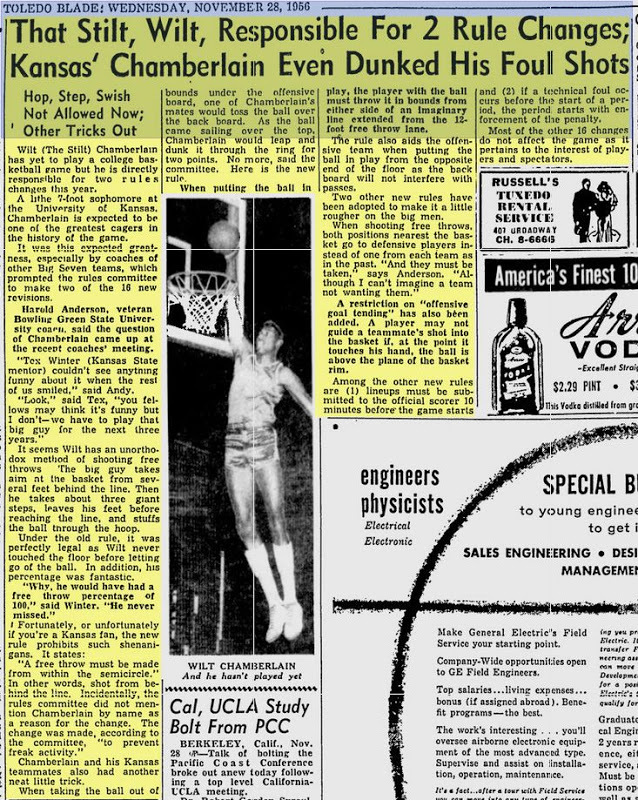 So, based on these witness testimonies and confirmation of them by Wilt himself, we would be with good reason to believe that Wilt Chamberlain was able to dunk from the foul line and did. Not the answer you're looking for? Browse other questions tagged trivia basketball or ask your own question. In basketball, is it legal to score directly from a throw in? Does the pressure of the crowd make a difference on free throw percentages? Are there instances of batsmen walking despite a lack of appeal from the fielding side?